The Pavilion Theatre was designed by the respected Theatre Architect Bertie Crew and opened on the 29th of February, 1904. The Building News and Engineering Journal reported on the new Theatre in their 18th of March 1904 edition saying:- 'The latest addition to the list of Glasgow theatres, the Pavilion Palace of Varieties, was opened last week. The new theatre, which has a central situation in the neighbourhood of Sauchiehall-street, at the junction of Renfield and Renfrew-streets, has been erected to the designs of Mr. Bertie Crewe, architect, of London. 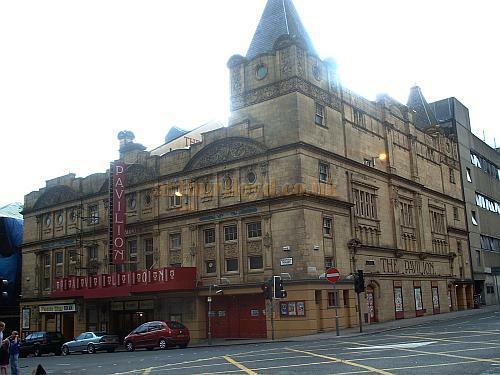 Right - The Pavilion Theatre, Glasgow in 2003 - Photo M.L. Its main elevation, which is towards Renfield-street, between Sauchiehall-street and Renfrew-street, is in salmon-pink terracotta, treated in an ornate manner in the style of the Later French Renaissance. In this elevation is the grand entrance-hall, with mosaic floor and mahogany fittings. Here, on the ground floor, are situated the stalls and pit of the building. The former are upholstered in plush, and the floor is covered with a thick Wilton carpet. The seats are of the tip-up variety, as are also the seats in the pit. A staircase decorated with mosaic work leads to the foyer, which is in white and gold, with panels of green silk paper. Left - The Auditorium of the Pavilion Theatre, Glasgow in 2004 - Courtesy Roger Fox. The seating accommodation in the circle consists of eight rows of seating, comprising 340 plush tip-up chairs. At the back of these are lounges, boxes, and a promenade. Here also is a fireproof cinematograph chamber, and there are two private boxes reached from the proscenium. The gallery, which occupies the tier above the circle, has fourteen rows of seating and promenades. The general scheme of decoration is in cream and gold, and a special feature is the proscenium arch, which is filled in with Watteau paintings. The ceiling is domed, and has a sliding roof. The stage has a width of 70ft. The auditorium, which is 76ft. in width, is without a single column in its whole extent. The above text in quotes was first published in the Building News and Engineering Journal, 18th of March 1904. 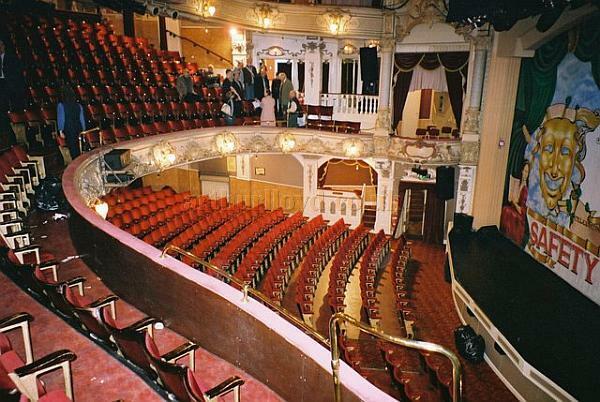 The Pavilion Theatre is still in use today and currently has a capacity of 1,449 made up of 677 in the stalls, 341 in the circle, 413 in the balcony and 18 box seats. In the 1940s and 50s the Theatre was famous for its long running Pantomimes. Right - A Period Programme for the Glasgow Pavilion Theatre - Courtesy Peter Charlton. Far Right - A 90th anniversary programme for the Pavilion Theatre, Glasgow - Courtesy Peter Charlton. The above textual extract in quotes is from the Theatre's website which you may like to visit here. An excellent photograph of the Pavilion's auditorium, taken by Ian Grundy in 1993, can be seen here. Information on the Origins and Developments of the Pavilion Theatre can be seen below. Information on the Collins Family and their involvement with the Pavilion Theatre can be seen below. You may like to visit the Pavilion Theatre's own Website here. The originator of today's Pavilion Theatre, Glasgow was Benjamin (Bennie) Simons, the eldest son of Michael Simons who among other things had saved the Theatre Royal, Hope Street, Glasgow in the 1880s and created Howard & Wyndham Ltd., which became the largest quality Theatre Group in the United Kingdom. 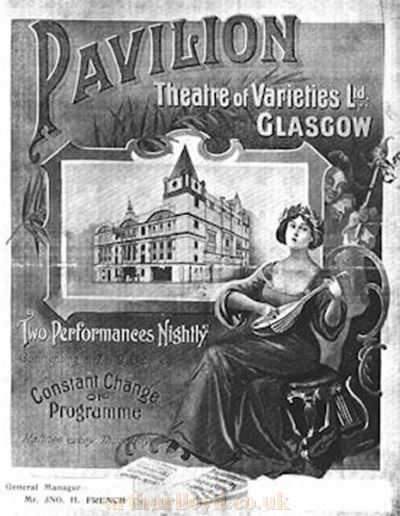 Right - An early Glasgow Pavilion Theatre programme cover, courtesy of the Pavilion Theatre. In 1901 Bennie Simons and his young family had just moved into their new home, at 7 University Avenue across from Glasgow University. Two years before, he had started his own fruit broker business in Candleriggs, supplied mainly by and next door to the headquarters of his father's renowned firm Simons, Jacobs & Co, the largest fruit broking and merchanting firm in the country. During 1901 the young men, Bennie Simons and Liverpool-born Walter de Frece (husband of Vesta Tilley), met and developed a partnership to create a new Variety Theatre; in their own words "to build, equip and work a high-class variety theatre in Glasgow." Above - A View of the 1901 International Exhibition in Kelvingrove Park, Glasgow - Courtesy Graeme Smith. This was during the time of the 1901 International Exhibition being held in Kelvingrove Park, attracting over 11 million visitors. Michael Simons was one of the leading promoters and a convenor of it. Walter de Frece was gradually increasing the number of music-halls he operated in London and along the south coast of England. They identified a possible site at the top of Renfield Street on the corner with Renfrew Street. 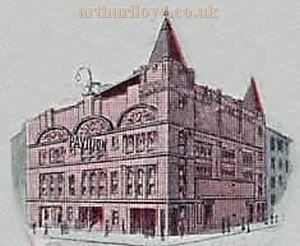 Right - A Promotion sketch showing the salmon pink terra cotta of the Pavilion Theatre, Glasgow - Courtesy Graeme Smith. Walter de Frece completed negotiations with the owners of the tenements and shops at the corner who agreed to sell to Simons and de Frece once the new company Glasgow Pavilion Ltd was floated. Simons and de Frece would add on their profit and sell it for £20,000 to the company. Which they did. Bennie Simons bought £2,500 of shares fully paid in the new Pavilion company. However, at the last moment in 1902 Walter de Frece withdrew from the longer partnership after discovering that Moss Empires and other operators were putting pressure on his wife not to appear in competing Theatres. Bennie Simons took him to the Court of Session in April claiming £5,000 for alleged slander, stating that de Frece was spreading rumours that he was dishonest and insolvent. De Frece claimed Simons needed the money. Simons' case was dismissed. Intriguingly, £5,000 was claimed at the Court a little later, November, by a young woman employed as a barmaid in Fergusons & Forresters - one of the high class restaurants in Buchanan Street. She was claiming, at the behest of Bennie Simons it was disclosed, that, after she and de Frece had met, de Frece then spread rumour in Glasgow and London about her moral reputation. Her case was withdrawn. In December 1902 Benjamin Simons was sequestrated, following business failures. The trustee examining his bankruptcy recorded his fall was due to "extravagance of living." Bennie Simons stood down from the board of directors of Glasgow Pavilion Ltd, but his father, Michael Simons, guaranteed the mortgage funding of the new company. Richard Waldon of the Royal Princess's Theatre, Southside, joined the board and held the theatre licence while Tom Barrasford, who in Glasgow had formed a partnership with Waldon, proceeded as the contracted operator of the Theatre and its first managing director. Right - Richard Waldon of the Pavilion Theatre, Glasgow - Courtesy Graeme Smith. A wide range of photographs and historic plans can be seen here, and architectural text here. It was built without bars, the policy being not to sell alcohol, and instead small buffet areas were created. The company Glasgow Pavilion Ltd. was floated in 1902 and its shares traded on the Stock Exchange. It became very profitable with annual dividends of 40%. Thanks to Rich Waldon and Harry McKelvie it worked in tandem for forty years with the Royal Princess's until that Theatre became the Citizens Theatre led by James Bridie. The Pavilion's board included a trio of city businessmen who created more theatres, cinemas and a cabaret dance club. The landmark venues continuing are the Pavilion Theatre, Glasgow and the Playhouse Theatre, Edinburgh. Taking up the seat vacated by Bennie Simons, James Duff, of whisky distillers Macleay Duff & Co headquartered in Glasgow, commenced as chairman of the Pavilion, continuing into the 1920s. 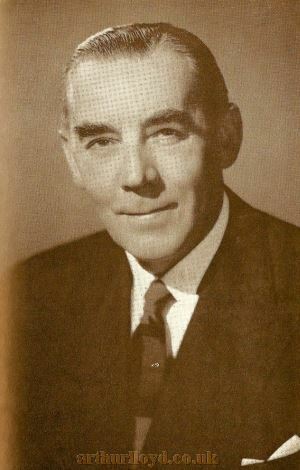 Champion sportsman, manufacturer and retailer Fred Lumley became a director, and from 1930 was chairman until his passing in 1938. He operated from Edinburgh and Glasgow – in which city his business premises as sports and athletics outfitters and equipment suppliers was at the corner of Sauchiehall Street, next door to the Pavilion. Right - James Duff, whisky distiller and first chairman of the Pavilion Theatre, Glasgow - Courtesy Graeme Smith. The Ballantine family became involved from early days. J. Lizars & Co, opticians and optical instrument makers, were founded in Glasgow in 1830 by John Lizars, succeeded by his son-in-law Matthew Ballantine in the 1880s who expanded the firm nationally, adding the manufacture of cameras and promotion of magic lantern slide shows, projectors and films. Left - Matthew Ballantine, optician, and a chairman of the Pavilion Theatre Glasgow - Courtesy Graeme Smith. 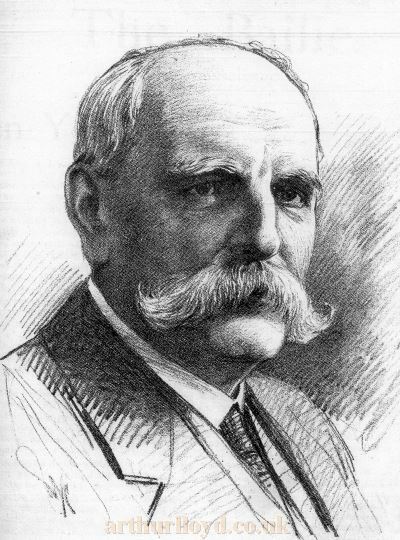 Matthew Ballantine retired in 1905, at age 42, leaving Lizars to be run by his sons while he started a second career, in theatre business, aware of its profitability. (Son Robert was a trustee of the bankrupt Bennie Simons.) 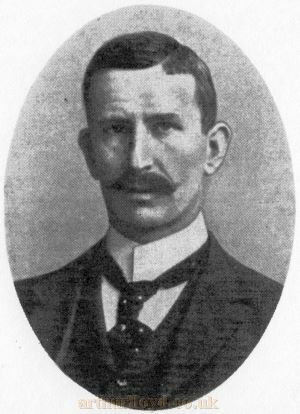 He would succeed Duff as chairman until his own passing in 1929. His sons also became directors of the Pavilion and a grandson Matthew Dumfries Ballantine would be the last of the dynasty as managing director and chairman until 1974. Guided by Rich Waldon the Glasgow Pavilion Theatre worked in conjunction with the city's Royal Princess's Theatre, Palace Theatre, Lyceum Theatre and with the Greenock Pavilion which changed its name to Hippodrome. They also gave support to Provost McMillan of Greenock when he opened the mighty Olympia Theatre, Bridgeton Cross, Glasgow in 1911. In 1913 the directors James Duff, Matthew Ballantine, Fred Lumley and Rich Waldon, with support from existing and new shareholders, opened a sister Theatre at the city's St George's Cross. This was the West End Playhouse, later named Empress, which was run directly from the Pavilion in Renfield Street. 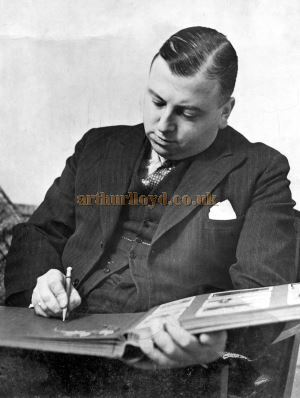 Right - Sports promoter Fred Lumley, a chairman of the Pavilion Theatre, Glasgow - Courtesy Graeme Smith. The Pavilion Theatre centred on variety, soon adding summer shows and pantomime. It trialled some afternoon cinema matinees in 1909 but did not introduce cine-variety as some variety houses did. But competition was growing. As reported by the Dundee Courier in December 1911: "In 1911 in Glasgow there are now about 50 picture palaces most of which had opened that year, and 3 new music halls opened in the year. Of the 50 about a dozen included variety acts." Moss Empires, Pavilion and Palace music hall directors met to express concern about variety shows being held in cinemas. The Glasgow Pavilion Theatre directors would open a new purpose built cinema just 50 yards away – the very advanced Picture Salon around the corner in Sauchiehall Street, see details below. Above - A colour postcard of Sauchiehall Street, Glasgow at Renfield Street, showing the Picture Salon. The Pavilion Theatre is next to Lumley's, out of sight in Renfield Street - Courtesy Graeme Smith. 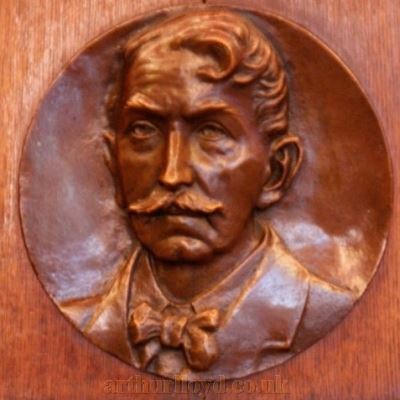 In 1912 James Duff, Matthew Ballantine and others formed the Picture Salon Ltd, being joined on the board in 1918 by Fred Lumley. To the designs of architect Thomas Baird the splendid Moorish-styled Picture Salon was built immediately next door to Lumley's premises and opened in January 1914, accommodating around 800 patrons. Finished in white faience tiling, and with a Winter Garden and Tea Lounge on the top floor - glazed overhead - it was the sixth cinema to open in Sauchiehall Street in a couple of years, and the first wholly new cinema building in Glasgow. Its management and orchestra was directed from the Pavilion. It did good business, with shareholders receiving in 1920 a 100% bonus on their shares from the built-up reserves. However, the growing recession hit custom and the Salon closed in early 1925. Shareholder and director Fred Lumley bought the whole building. He had it redesigned in Edwardian style but still essentially white. His sports and outfitters businesses moved in (from next door!) and the Salon was renamed Lumley House, with intermediate floors inserted in the former auditorium space. The same year, 1926, the top floors reopened as The Piccadilly Club, providing dance, cabaret, lounges and cocktail bar. 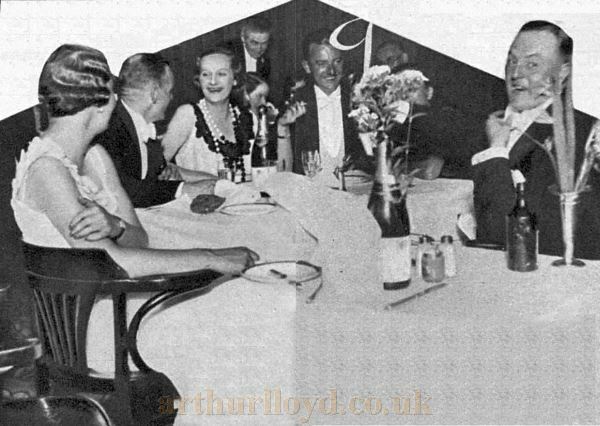 Right - A table in the Piccadilly Club, Glasgow at the Duke Ellington Gala Night, July 1933 - Courtesy Graeme Smith. The original winter garden balconies overlooked the dance floor. The floor below housed the club-room, lounges and offices. The general colour scheme was maroon and gold, with blue carpets. Cabaret was frequently twice nightly and the club accommodated 500 dancers at a time. Entertainment ended at 2am. 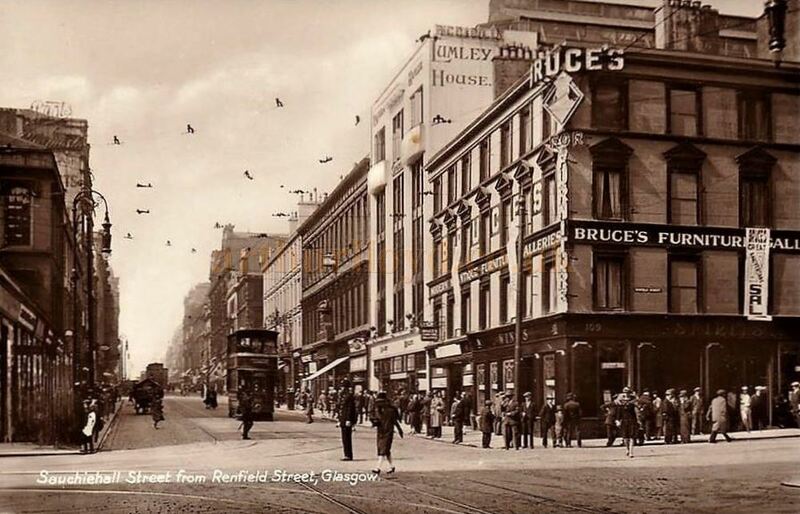 Above - A 1920s postcard of Sauchiehall Street at Renfield Street showing Lumley House, to the right, with the Piccadilly Club atop - Courtesy Graeme Smith. 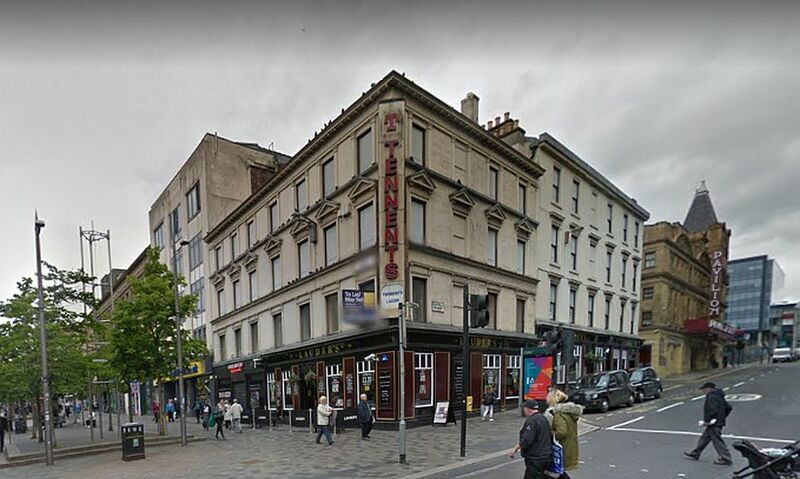 Above - A Google StreetView Image of Sauchiehall Street and Renfield Street showing the site of the former Picture Salon, later the redesigned Lumley House and Piccadilly Club, since destroyed by fire in 2018; the former Lumley's Athletics Outfitters building, today a pub; and to the right the Pavilion Theatre - Click to Interact. 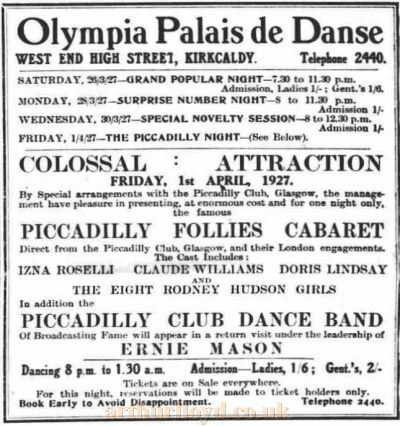 Right - A Fife Press advert in 1927 of a special appearance in Kirkcaldy of the Piccadilly Follies Cabaret and the Piccadilly Dance Band from Glasgow - Courtesy Graeme Smith. 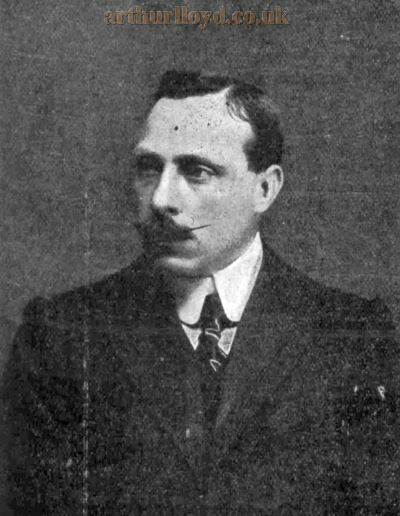 Jack Hylton invested in the Club and his wife Ennis also became a director. Dance orchestras and jazz bands competed for residence. Mrs Hylton was a soubrette and band leader with her own band which can be enjoyed here. Her pianist, and often singer, Jimmy Miller formed the Squadronaires (Royal Air Force Dance Orchestra) in WWII – the original five all being Scots. Left - Alan Fairley, cabaret producer and general manager of the Piccadilly Club , Glasgow, creator of Mecca Dancing - Courtesy Graeme Smith. From the early 1930s to 1950s, dancers, singers and cabaret artistes were engaged through the Fred Collins Variety Agency which was now servicing the Pavilion. Architect drawings and photographs of the building can be seen in the Scottish Cinemas website here. The Piccadilly Club continued into the 1960s, later changing its name a few times. The restaurant below it in the 1960s onwards also changed name, becoming firstly the long-remembered Lucky Star, of Chinese cuisine. The whole building was destroyed by fire in 2018. Fred Lumley, resident in Edinburgh, operated the Powderhall Racing Ground, presenting numerous sporting tournaments and introducing greyhound racing. Near to his shop premises in Leith Street he built up a range of venues. In 1909 he and Matthew Ballantine formed the Olympia Palace for roller skating and hockey, boxing, concerts and cinema. 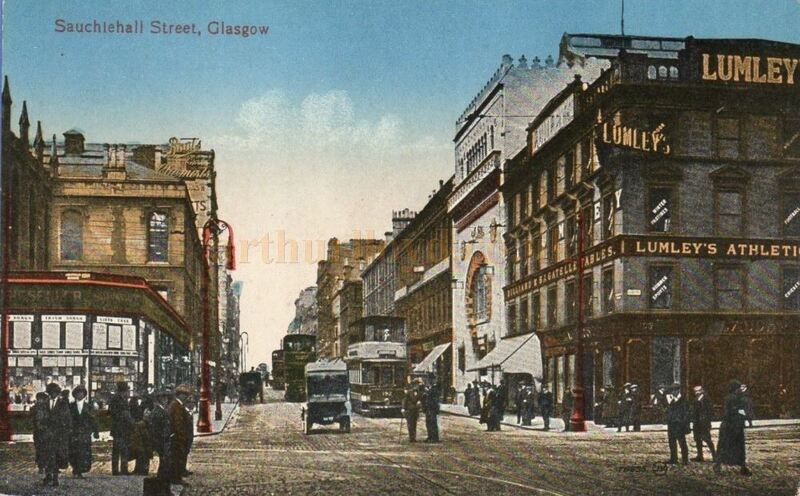 In 1914 Lumley opened the prestigious Palace cinema in Princes Street, which can be seen here. During WWI he bought from the estate of Sir Edward Moss the old Tabernacle at the top of Leith Walk which Moss had never developed; Lumley held it awaiting the right moment. For years he conducted the Waverley Market Christmas Carnivals. It was in 1927 when he announced he would develop the Tabernacle site as a major venue which could be a cinema and a fully equipped performing theatre. He selected Glasgow architect John Fairweather to design The Playhouse, complete with a fly tower and numerous dressing rooms, and seating 3,000. 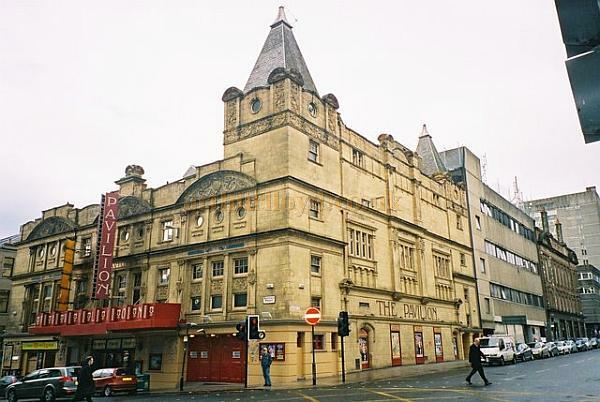 Fairweather had already designed many cinemas for the Greens of Glasgow, including Greens' Playhouse in Renfield Street (opposite the Pavilion Theatre) seating 4,400 – the largest cinema in Europe. Lumley's Edinburgh Playhouse today is the largest performing Theatre in Scotland. Under the chairmanship of Matthew Dumfries Ballantine, Glasgow Pavilion Ltd bought Ayr's Gaiety Theatre in 1965, with Eric Popplewell becoming production director at the Pavilion and Leslie Popplewell remaining at the Gaiety. Six years later they put the Gaiety up for sale and demolition but it was saved by Ayr Town Council. 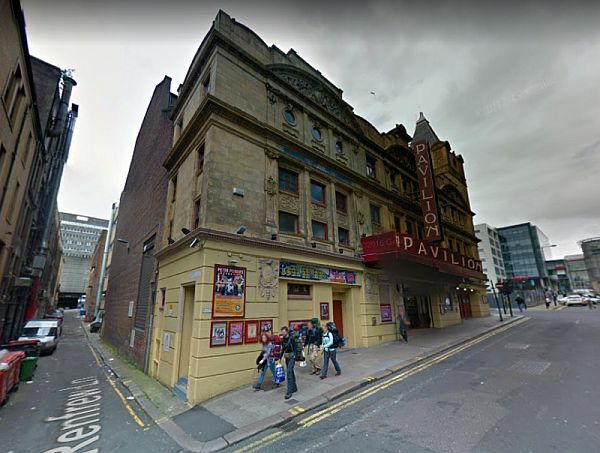 Right - A Google StreetView Image of the Glasgow Pavilion Theatre - Click to Interact. 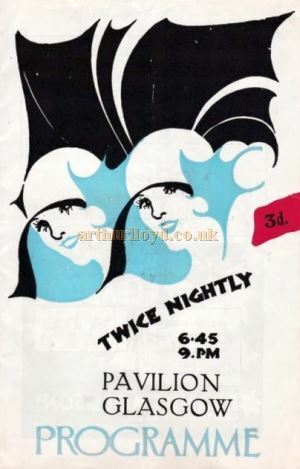 From the late 1970s there were a number of changes of ownership of the Pavilion Theatre, with it finally settling in 1986 under the ownership of the Martin family of Ayrshire who also own Fairfield House Hotel, Ayr. A founder director in 1902 was William Martin, stockbroker, of Ayrshire. 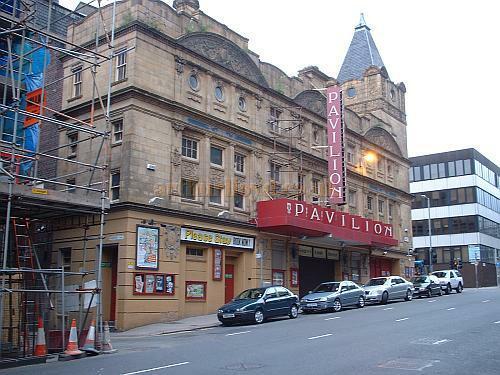 The above article on the Origins and Developments of the Glasgow Pavilion Theatre was written by Graeme Smith and kindly sent in by him for inclusion on this site in April 2019. The Fred Collins Variety Agency engaged artistes for the Pavilion Theatre and many other theatres throughout Britain. It had been started by comic and singer Fred Collins (real name James Nelson) who in his earlier years wrote over 300 songs for performers including Sir Harry Lauder. Before forming his own Fred Collins Entertainers of pierrots the two toured together and remained life-long friends. Right - A Pavilion Theatre Glasgow Programme Cover from October 1932 - Courtesy Ross Collins. 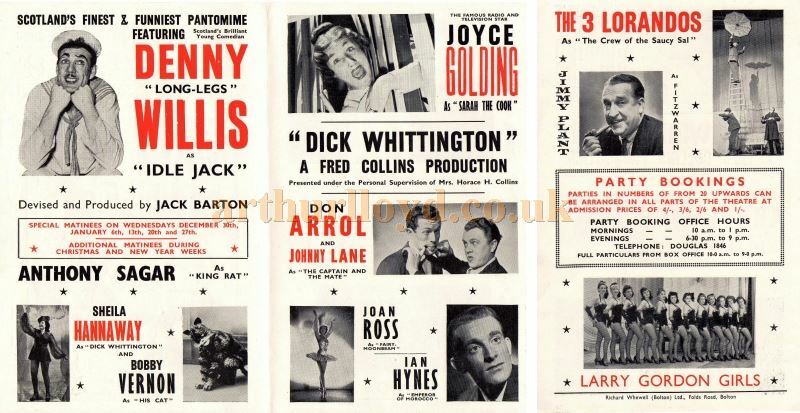 Collins soon commenced the production of pantomimes, with Collins Productions Ltd writing and producing major pantomimes and seasonal shows for their own expanding bases and for other circuits. They produced all the scenery and costumes for each production and tours, at their workshops in Edinburgh. Left - Horace Collins 1901-1947 - Courtesy Ross Collins. His son Horace Collins, shown left, succeeded him in 1931, developing their own Five Theatre Circuit - one major theatre in each city of Scotland and one in England, to comprise a full year seasonal variety circuit - which included the Tivoli Theatre Aberdeen, the Palace Theatre Dundee, the Theatre Royal Edinburgh, the Shakespeare Theatre Liverpool and the Pavilion Theatre Glasgow in which he was a major shareholder. Above - Pages from a Pavilion Theatre Glasgow Programme for 1950 - Courtesy Ross Collins. 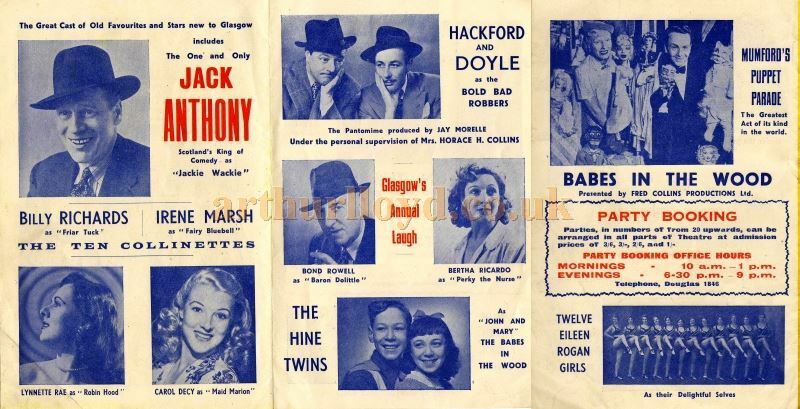 Above - Pages from a Pavilion Theatre Glasgow Programme for 1953 - Courtesy Ross Collins. The excellent Collins Variety Agency of Scotland website contains much about the Collins enterprises and the Pavilion Theatre. Horace Collins was also a keen film photographer, and excerpts of his filming of pantomimes have been secured for public delight, set to music in association with the Orchestra of Scottish Opera and the University of Glasgow. The restored films include Sinbad the Sailor starring Dave Willis filmed at the Glasgow Pavilion Theatre during its 1936-37 run, which can be seen here. And Forty Thieves starring G. H. Elliot and Jack Anthony filmed in colour at the Glasgow Pavilion Theatre during its 1937-38 run, which can be seen here. The above article on the Pavilion Theatre and the Collins Family was kindly written for this site by Graeme Smith in March 2017. Accompanying images are Courtesy Ross Collins.